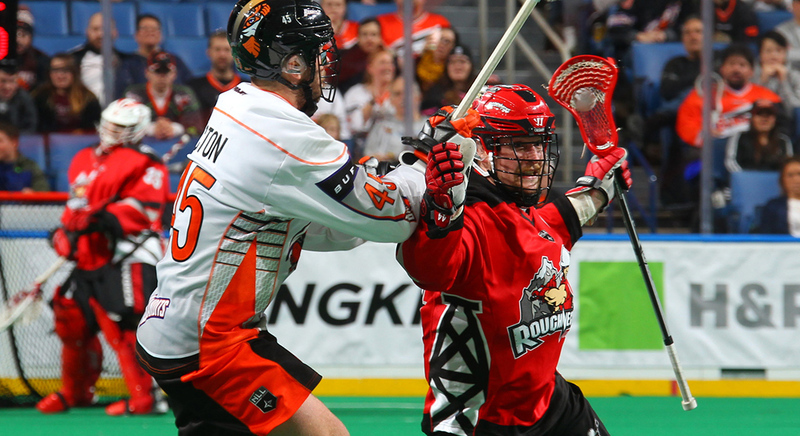 The Roughnecks fell 13-8 to the Bandits at the KeyBank Center in Buffalo on Saturday. Calgary trailed 5-3 at the half and wasn’t able to dig out of the early hole, falling to 1-3 on the season. To open the game, the teams flew out of the gates, trading transition goals from Kevin Brownell and Riggers captain Dan MacRae. On back-to-back series late in the first quarter, Wesley Berg and Dhane Smith each found the back of the net, but had the tallies taken away after successful challenges for crease violations. The track meet continued for most of the first half, with a number of transition goals — and even more opportunities — coming at both ends of the floor. Defender Garrett McIntosh and forward Curtis Dickson also scored for the Riggers over the opening 30 minutes, while Justin Martin and Jordan Durston added transition markers for the Bandits. Former Roughneck Callum Crawford led the way for the Bandits, scoring four goals — including the final three for the home team — and an assist. Durston added a hat-trick and Justin Martin scored the first of his career. “Callum is very dynamic, you don’t know if he’s shooting or passing, he creates a lot of separation with his feet,” said Malawsky. “You think he’s committed to going to the net and he pulls up and hits someone. He’s a tough check. He’s a quarterback out there. For the Roughnecks, Dickson matched Crawford’s four goals, while Dane Dobbie added a pair of tallies. Between the pipes, Bandits netminder Alex Buque stopped 44 of 52 shots, while Riggers goalie Frank Scigliano made 38 saves on 50 shots. The Roughnecks controlled the face-off circle in the contest, winning 19 of 26 draw. Tyler Burton was responsible for all but one of those wins, with Zach Currier winning his lone chance in the dot. The Riggers will look to get back in the win column when they return to the Scotiabank Saddledome to play the Georgia Swarm on Saturday, Jan. 13. Team is not performing, this year turning out like last year, think its time to look at changes, starting with coaching. Try to salvage something before it is to late.